The Venice Beach Boardwalk tops the list of things to do in Venice, California, a beachfront neighborhood of Los Angeles. It's also one of the top things to do in Los Angeles overall. The Venice Beach Boardwalk is a one-mile street market and free speech zone on the paved two-mile Ocean Front Walk on Venice Beach. The busiest stretch is from North Venice Boulevard at the south end to about Park Avenue at the north end, with some scattered bars and shops continuing up to Rose Avenue. The east-side (inland) permanent buildings, which house shops, restaurants, snack bars, hostels, hotels and residences, and private property. Everything else from the concrete boardwalk to the ocean is a Los Angeles city park, which also includes all the facilities of the outdoor Venice Beach Recreation Center. The iconic suspended "Venice" sign marks the entrance to the Venice Beach Boardwalk at Windward Avenue, one of the most recognizable sections of the area. If you only have limited time, this is a good place to start because you can see most of the key attractions within two blocks north and south of this point. There are large pay parking lots on the beach at both ends of the Boardwalk, with smaller pay parking lots scattered through the neighborhood and another large stretch of less expensive pay parking between North Venice and South Venice Boulevard stretching from one to three blocks inland. There's also a very limited amount of metered street parking, and even more, limited free street parking in the neighborhood. Beware the street spaces on Windward Avenue near the beach. They may look free, but there's a central meter on each side of the street to pay for the numbered spots, and they have a one-hour time limit. You will probably want to explore for more than an hour. Check out the following photos to see all the things to see and do at the Venice Beach Boardwalk - aside from the actual beach. 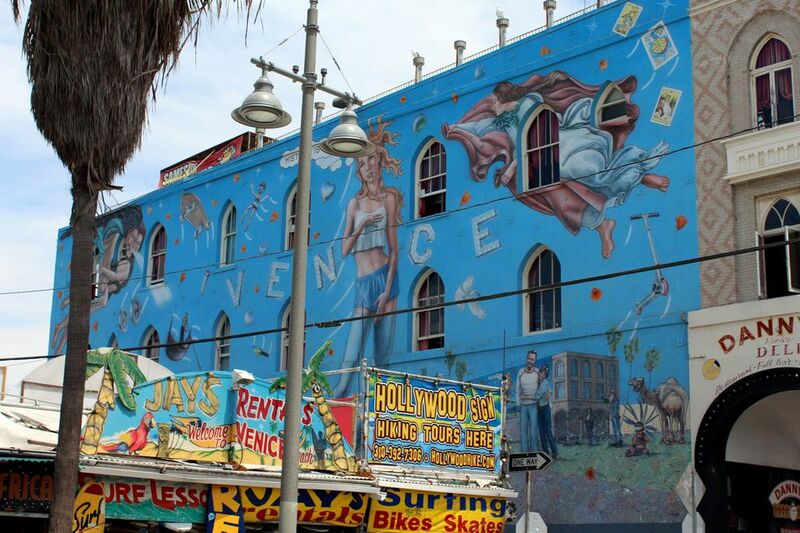 You'll find a mural called "Touch of Venice", on the inland side of the Samesun Backpacker's Hostel at the corner of Windward and Ocean Front Walk. There is another impressive mural on the beach side of the building. You'll find murals, sculptures and other public art up and down the Boardwalk. In between the $5 sunglasses and 3-for-$15 T-shirts, you'll find bohemian clothing boutiques, unique jewelry stores and a number of head shops. You'll also find artists selling all kinds of original works from beach-side stands opposite the shops. The vendors line up early to get one of the 205 free spaces available to artists, performers, and activists expressing free speech. If you see something you love at one of the vendor tables, get it. That artist might not be there if you come back another day. Even if you're not a shopper, watching the diversity of humanity that pours along the Boardwalk any given day is a form of entertainment in itself. The size of the crowd and the parade of skin are naturally more impressive in the ​summer months and warm winter weekends, but you never know what or whom you'll run into, even on a foggy winter weekday. You'll find musical acts, spoken word artists, dancers, contortionists, acrobats, jugglers and miscellaneous others showing off their skills. You'll also find various activists distributing leaflets and buttons on a variety of subjects. 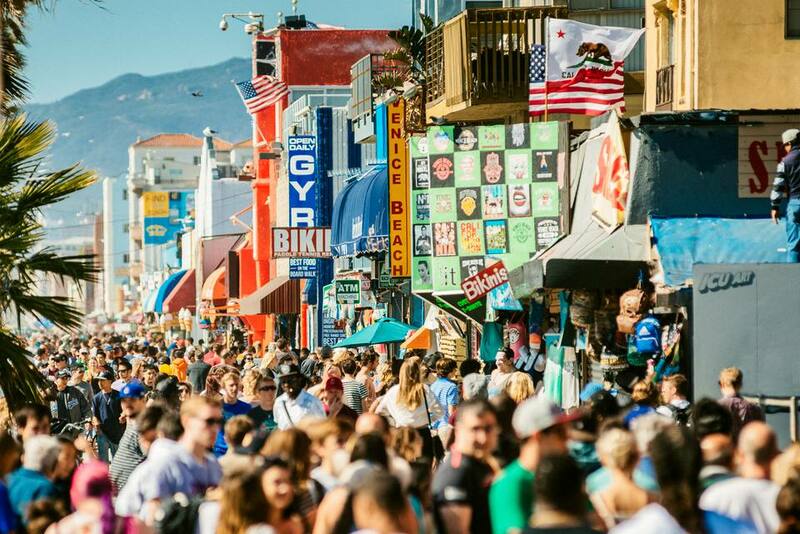 Free permits are required to perform on the Venice Beach Boardwalk and they're given out first come, first served at the beginning of each day. During peak season, some acts have to share spaces and alternate every hour so that more performers get a chance to perform. This means you may see different acts when you walk back then were in the same spots when you walked out. If you decide to whip out your guitar or juggling pins and join the fun without a permit, it's a $100 fine. The Venice Art Walls continue the tradition of free speech with artists taking turns painting the art walls, each one over top of the one before. The project is managed by In Creative Unity, a Venice-based art production company that specializes in murals and live painting events. Opened in 1963, Muscle Beach Outdoor Gym is known for being the training ground for such renowned bodybuilders like Arnold Schwarzenegger, Lou Ferrigno, Franco Columbu and Frank Zane. You can get a day pass to work out at Muscle Beach and it's half price if you're over 60. It's free to watch and ogle, which is what most people do. Thy gym is closed on some holidays and rainy days. They host a number of bodybuilding competitions each year including the Mr. & Ms. Muscle Beach Contest every year on the 4th of July. You don't have to get a pass to Muscle Beach to test your fitness level. There is a free gymnastics course on the sand next to Muscle Beach where you can try your hand at the balance beam, rings, rope climb or other equipment. A much more recent addition than Muscle Beach is the Venice Beach Skate Park. It is very popular with skateboarders and everyone who likes to watch them. Boys and girls and men and women share this set of concrete bowls and rails set right into the beach. There's another patch of flat concrete with some low rails in the grassy area that separates the main Skate Park from the Boardwalk. The Skate Park closes on Christmas and when it rains. With everything else going on at the Venice Beach Recreation Center, I guess they don't have as much demand for volleyball as other beaches with fewer amenities. There's only one volleyball net at the Rec Center with another one up the Boardwalk at Wavecrest Avenue and two at the north end of the Boardwalk at Sunset Avenue. There are another five volleyball nets on Venice Beach south of the Boardwalk toward the fishing pier. There is a children's playground amid the bustle of the Venice Beach Recreation Center in a fenced sandy area between the Rec Center office and the Bike Path, one block south of Windward at the end of 17th Avenue. There's another playground at the north end of the Boardwalk adjacent to the parking between Rose Avenue and Ozone Avenue. You're not allowed to ride your bike on the Venice Beach Boardwalk. You have to get off and walk it or risk getting a ticket. However, the Venice Beach Bike Path, AKA the Strand, runs parallel to the Boardwalk, sometimes right next to it and sometimes farther out on the sand. It is part of the Marvin Braude Coastal Bike Trail, which runs along the coast from Pacific Palisades in the north to Torrance Beach to the south, with a detour inland around Marina del Rey. If you don't have your own bike, there are bike rental businesses at the south and north ends of the Venice Beach Boardwalk near the beach parking lots as well as on Windward and a few other locations including one electric bike rental option. In addition to bikes, you can rent skates, strollers, and wheelchairs at some rental locations. You can also rent one a Bike Share bike from the Santa Monica Breeze Bike Share program, which has hubs on the north end of the Boardwalk at Rose Avenue and Park Avenue. You can also pick one up in Santa Monica and bike down from there. If you're heading for the water, you can rent surfboards, boogie boards and stand-up paddleboards (SUPs) right on the Boardwalk. A lot of vendors only take cash, so there are ATMs (bank machines) everywhere. If you're not a bike person, you can still zip up and down Venice Beach on wheels with a Segway from Venice Segway Rentals just north of Windward near the Skate Park. They'll show you how to ride it and make sure you're comfortable before sending you off on your self-guided beach tour. You can also take a guided Santa Monica and Venice Beach Segway Tour from Santa Monica. Most of the food along the Venice Beach Boardwalk is sold at snack bars. There are only a couple places with table service, including the Sidewalk Cafe, with prime people-watching tables. But the happening place to be for a cocktail is the Rooftop Bar at the Hotel Erwin, which overlooks the Boardwalk right above Muscle Beach near the intersection of Windward Avenue and Ocean Front Walk.